These easy peasy crab stuffed mushrooms make an awesome holiday appetizer; perfect for your next party! Pre-heat oven to 350 degrees F and line a rimmed baking sheet with foil. Drizzle foil with a little olive oil or use butter for extra oomph. I alternate between the two and it's great either way. Alternatively you can skip the baking sheet altogether and use your favorite cast iron skillet to do the job. Make sure you use a little butter or oil for either option and you're good to go! Remove the stems from your mushrooms and arrange mushrooms on the baking sheet/skillet. Finely dice your veggies and, with a ½ TBSP of butter, saute the celery, onion, and red pepper. Towards the end, add your garlic and continue to saute until onions and celery are translucent and tender and mushrooms are fully cooked. Add your crab and cheese, then mix. Depending on preference, you can add the panko to the stuffing mixture along with the crab and cheese or save it as a crispy topping. I love them both ways, choose your favorite! Spoon mixture into mushroom caps and sprinkle with paprika. Toss your panko breadcrumbs with a little melted butter (or oil) and press gently on top of the filling to overstuff each mushroom. Bake for 15-20 minutes or until mushrooms are tender and panko is golden. MAKE AHEAD DIRECTIONS: Follow all the steps as written minus the addition of panko and the baking of the mushrooms - you'll do that right before serving. 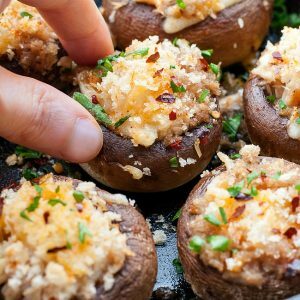 When I'm making these in advance I skip using a skillet and arrange my stuffed mushrooms on a lined baking sheet. Cover with plastic wrap or foil and place in the fridge up to 24 hours in advance, then remove cover, add panko and bake. Easy peasy! GLUTEN FREE? Skip the panko and you're good to go!